Finally, I'm catching up a tad on my ring design. As you can see, I have plenty of ideas to explore, but time to execute is sorely lacking. Today's offerings aren't quite up to my standards, as I see some finishing issues I slighted by rushing to get all three rings into the kiln last night. I suppose this is how I learn which things need more attention. 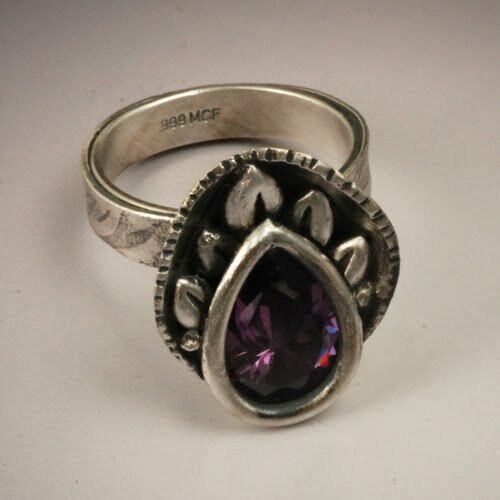 First, I wanted to incorporate a larger stone, so I built a mounting for this 12x8 mm pear shaped purple CZ. My method for using polymer clay to create a mold for the mounting was a bit clumsy and more tricky than it needed to be, but now I have new ideas for how to do that more simply next time. I inserted the CZ with mount into a cutout in a domed disc, knowing that shrinkage would distort the circle to an oval. I planned my design to incorporate that and it seems to have worked fairly well, although there is some asymmetry that I would like to learn to control better. 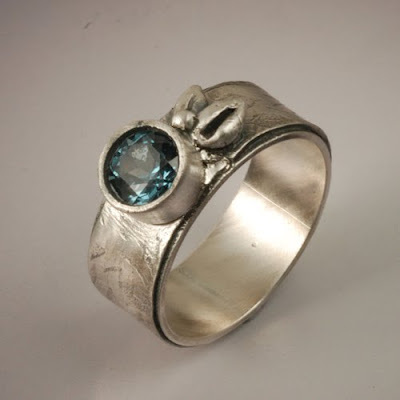 Second, I decided to try a tube mount for a faceted round blue spinel. I learned this technique from Gordon Uyehara at a workshop in Florence, Italy several years ago, but haven't used it since. Even then, I modified the technique to avoid the seam in the tube because of fears of it popping open during shrinkage around the stone. This time I tried Gordon's method and, while the seam didn't open, I can SEE the seam, so I obviously didn't get it perfectly merged. Tricky, tricky. I also had an issue with hiding the seam in the wrap around the ring liner. I thought I would hide the seam completely with leaves and details, but wound up liking the simpler look that leaves that seam a bit too exposed. I did a bit of repair and refired, but it still isn't up to my standards. The concept is interesting however. There are many possibilities to ponder. Finally, I slapped together another plain domed disc ring made with a texture of one of my Zentangle drawings. 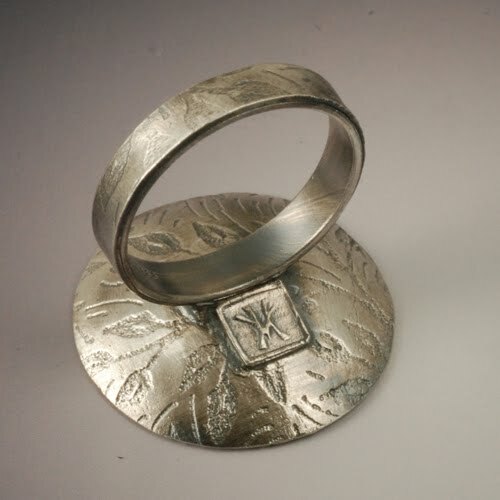 This ring I find extremely effect for its simplicity to construct. Plan better for shrinkage of metal clay vs. other materials, either fine silver or stones, including distortion and reinforcement. 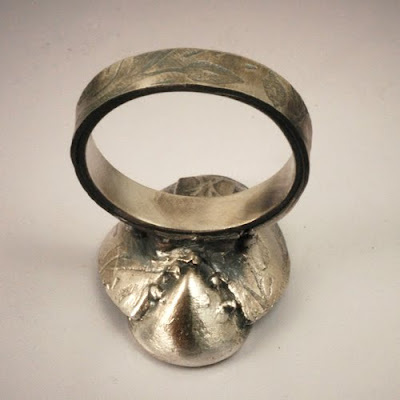 Consider how to make ring inserts blend more effectively: file down edges after shrinkage? Wrap? Think more about how revealing macro photos appear -- why do I always see defects here that aren't apparent to me at the stage where it would be easier to correct? 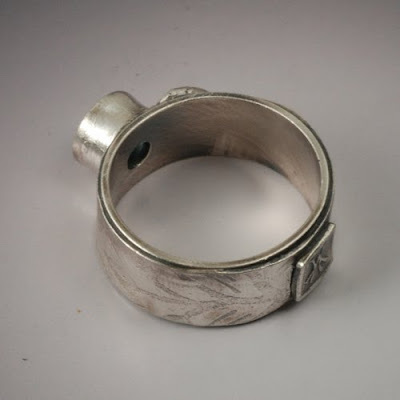 Do I need to look at pieces with a loupe? Or buy serious magnifiers? Why will I never learn to read your blog before asking questions on Flickr! So - is the tube mount hard metal? Or is it a metal clay one that you built first. Not clear. Same with the pear. You made a poly clay mold? Why? So not understanding. But they're gorgeous, whatever you did. You seem to like the ring liners. I haven't tried them yet. Lore cuts her metal clay about a millimeter thinner than the band so that there's an intentional reveal. Nice detail. Seeing the double thickness doesn't bother me though. 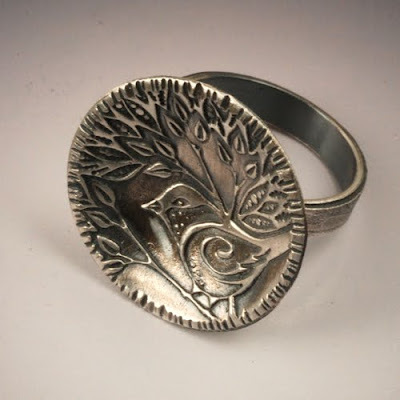 I LOVE the simple round ring with the bird and tree etch. Is this one going to be on sale on your Etsy sight?